Northwest Homesteader was developed in conjunction with the Community Museum Project, a virtual museum designed to showcase a community-based history of the Olympic Peninsula, Washington. The packet focuses on this region as a means of exploring the different facets of homesteading in Washington and the nation as a whole. 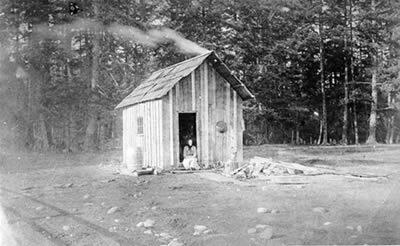 Many of the primary sources used in Northwest Homesteader come from the CMP archives and virtual exhibits, which also feature collections in logging, mountaineering, and Native American history. Northwest Homesteader complements the CMP website by articulating its educational mission through a combination of short historical essays, primary sources, timelines, and other resources intended as starting points for a variety of approaches to understanding homesteading, from short-term lesson plans to extended research projects. Homesteading may now be confined to history, memory and physical remains, but its legacy has had a lasting influence on the peopling of the West. The packet consists of four major thematic elements: Introduction and Legislative Chronology, an essay to orient teachers on the development of federal land use policy relevant to homesteading and how it applied to Washington; Deciding to Go and Getting There, information relating to why homesteaders might have emigrated to Washington and how they arrived there; Proving Up, a multi-sectioned account of homestead life in terms of fulfilling the requirements of homestead law; and Life on the Homestead, a look at daily life and hardship. Each theme or section contains a short contextual description, which can be used with conjunction with relevant primary sources such as maps, guidebooks, photographs, and excerpts from diaries. The primary sources constitute the central value of the packet, and additional resources provided by the packet include lesson plans, a timeline, digital resources, a bibliography, and a list of potential field trips.